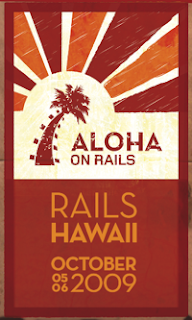 Don't Miss Aloha on Rails! You don't want to miss the Hawaii Ruby On Rails Conference - Waikiki, Oahu, Hawaii - October 5-6 2009. The speaker list is impressive and still growing. The venue is awesome and is only a short (really short!!!) walk from Waikiki beach. The economic downturn is making flights to Hawaii very reasonable right now. This conference is being primarily organized by Seth Ladd, a Honolulu based RoR developer and great co-worker of mine. There is an Aloha On Rail Blog featuring the latest information. The latest post features another great co-worker of mine, Honolulu Hacker Kevin English in a clip on why you should come to Aloha on Rails. This is a no brainer - register now!